The Bitcoin market was choppy this last week, to say the least. The bearish sentiment in the market was aided by some very negative news from China, which resulted in a violent crash on Wednesday, followed by a tepid recovery. Here is a summary of last week’s Bitcoin news, and a well written wrap-up of the progress of Bitcoin through 2013. We are still continuing the now 3 week long bearish trend following the price bubble of November. The new low of $382 which we reached on Wednesday was only a local low, and there is a good chance that we will test this level again, going down. As this article is being written, the Bitstamp price of Bitcoin is inching closer to the upper trendline of the major downtrend. I expect it touch this line later today or early tomorrow. 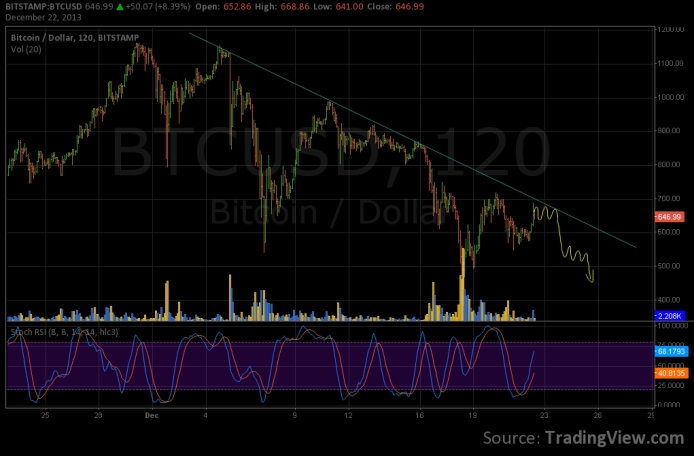 A upward breakout from this line would signal the start of a new bullish trend, but this looks highly unlikely. The market is yet to fully discount for the Chinese news, and I expect this to lead to a slow decline over the holidays, extending. The major support levels are at the $600-$590 level and the $400 level. We can expect high volumes at these levels, and these supports will likely be tested a few times before they are broken. It is difficult to gauge the extent of this downward trend. We are already seeing reasonably high buy pressure starting at the ~$550 level. It is possible that this leg of the major downtrend will not lead to a new low, but would stop close to the $500 or $450 level. If this happens, it would be a long-term (1–2 months) bullish indicator. Just want to thank you so much for your honesty. Please keep posting such charts and your opinion. You are helping newbies like you. I’m happy to have helped you, Sid. Also comming from Reddit. Thank you a lot for this post. I’m learning a lot thanks to you on how to analyse the markets.